Send Classic Roses in a vase to Chennai. Gifts to Chennai. Send Flowers to Chennai. 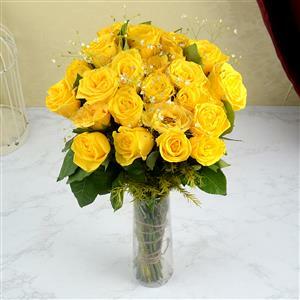 Description : This bunch of 24 sumptuous Yellow roses will help you to convey your love and warm wishes. The roses arrangement is decked elegantly with green leaves and fillers in a glass vase. Enfold your wishes in this bouquet and send this to Chennai with the assistance of Gift2Chennai.com. Send Gifts to Chennai and add to the happiness of your dear ones on any occasion.